Enough already with all the stressing over Thanksgiving wines. Truth is, the Thanksgiving meal is a mess. The chances of choosing a wine to match that cacophony of flavors are slim to middling. Sweet to ultra sweet sweet potatoes and cranberry sauce. Bland meat to savory sausage-and-herb stuffing. Creamy dressing to green beans with almonds. What’s a host to do? One option is to go commando and serve what you and your guests will like, pairings be damned. Got a Zinfandel crowd? Go for it, serve Zin. Make it a 2009, a vintage whose cooler temperatures helped bring balance to this notorious heavyweight, plus lower alcohol levels. If your group sways Chard, try an unoaked or lighter-oaked version, perhaps from Oregon or a California no-brainer such as Monterey’s Morgan Metallico or Four Oaks Naked Chardonnay from Santa Barbara County. You can also challenge a white-wine crowd with an off-dry selection to complement the sweet spot in many Thanksgiving sides and sauces. German or Washington Riesling do the trick, as will a South African Chenin Blanc or an off-dry Loire Vouvray. Look for South Africa’s MAN Vintners or Ken Forrester; in the Loire, Guy Saget has got it down. If that touch of sweetness doesn’t work for your gang, aim for Pinot Gris, which is about as food-friendly a white wine as you’re going to find. Oregon is the winner here, with great selections from King Estate, A to Z and others. Not there yet? Don’t be blasé about rosé, a wine with enough pizazz to carry the Thanksgiving meal, from appetizers up to dessert. But if pink is not your deal, look to Pinot Noir to save the day. A fruitier version makes a more harmonious choice with turkey sides. Choose a warmer vintage or growing region, whether a 2009 from Oregon or a juicy California crowd-pleaser, as in the value-priced 2009 District 7 from not-so-warm Monterey. Plenty of 2010 beauties await too, from Sonoma on down the Central Coast. Flowers, Failla, Calera, Cambria, Byron, Sanford and Siduri are sure to deliver, California-style. If you have a real party crowd on your hands, go bold with bubbles. A pretty Lambrusco from Italy will work its magic, while a perky and sweeter Shiraz sparkler like Jam Jar is ace to get your party started. Finally, if your turkey wine doesn’t have to be born in the USA, look to France and cru Beaujolais. Skip the just-arrived nouveau stuff that can come up short in complexity and depth. 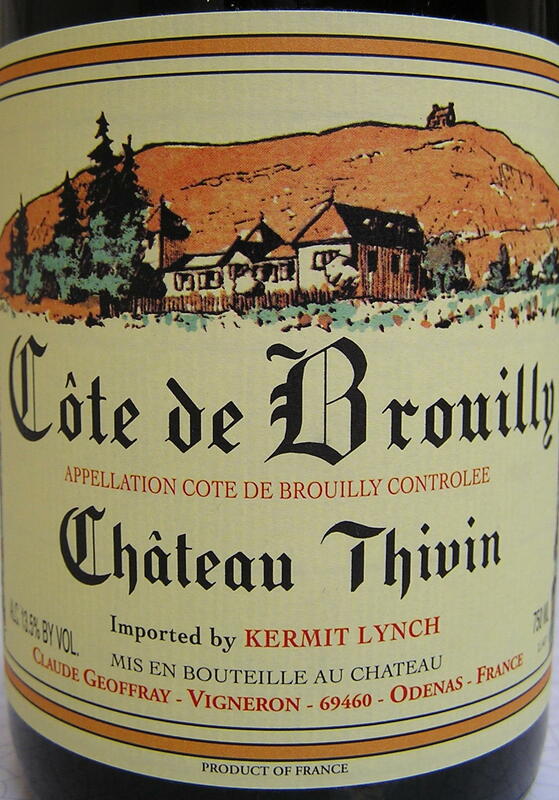 Instead, seek out Beaujolais from designated cru regions, such as Côte de Brouilly, Morgon or Fleurie. The 2009 vintage produced a bevy of gorgeous wines – look for them, or take a shot at value-priced Beaujolais-Villages wines from producers such as Georges Duboeuf. To better enjoy their verve and fruity freshness, pop them in the frig for 20 minutes before serving time, just to give them a little chill. So what’s this year’s pick for my Thanksgiving crowd? 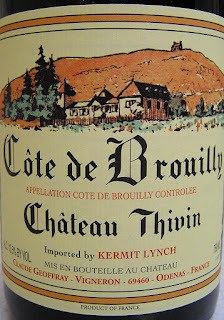 At the risk of being branded un-American, I’m going with the Château Thivin 2009 Côte de Brouilly. When first tasted earlier this year, it seemed to have Thanksgiving written all over it with enchanting aromatics and luscious, fresh fruit flavors wrapped around a core of earthy spice. Now that its exuberance has been tamed by a few more months in the bottle, I’m betting on this cru Beaujolais to pull our meal together with punch and intrigue. If it falls short or gets lost in the Thanksgiving flavor mosh pit, there won't be any stressing. Instead, we'll look ahead to the next wine-in-waiting, with someone eager to pop a cork and offer thanks for all that we have around the table, in each other, in life.